Coffee Lake Z370 Motherboard Bonus – Free ROG Strix Mouse with Asus! 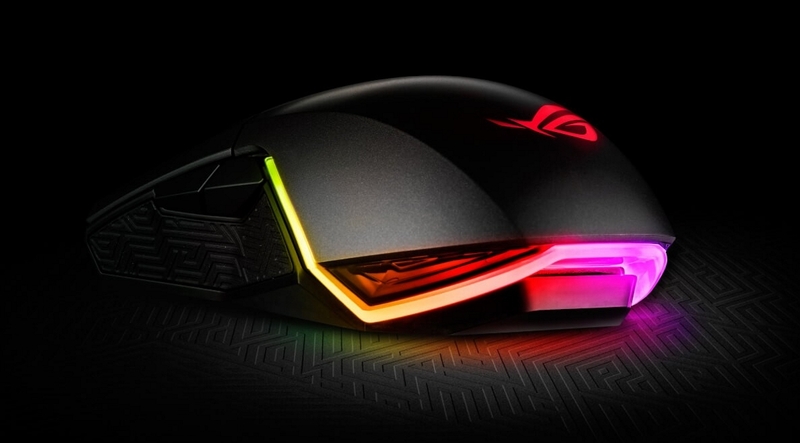 Up for grabs are two excellent gaming mice, the first is called the Asus ROG Strix Impact and it’s a beautiful AURA sync ready RGB ambidextrous option that’s packing a very nice 5000dpi sensor. To get your hands on this one simply purchase any of the motherboards linked below, then register to redeem via the Asus ROG Free Mouse Redemption Site. The next mouse up for grabs is available to those who are grabbing an above motherboard, and also an Asus ROG Strix Graphics Card from the list below! This mouse is pretty special too, it’s brand new and just made it’s first appearance in New Zealand a couple of weeks ago – the ROG STRIX PUGIO! This one’s also an ambidextrous gaming mouse but it has got some sweet configurable magnetic side buttons that let decide on your own side button layout, with exclusive push-fit switch sockets offer variable click resistance. The PUGIO also features some truly stunning aesthetics to match its performance – including angular ASUS Aura RGB light channels that can be controlled with Aura Sync! This mouse is really quite wonderful, so much so we’ll leave this here with a massive picture of the mouse to drool over below 🙂 GAME ON! Good Gaming PC – The ROG GR8 II Mini Gaming PC! The Asus Republic of Gamers GR8 II is a Gaming PC that packs excellent gaming performance into a very cool, very small package. Perfect for those who want all the power of a desktop Gaming PC, but are looking for something really small it’s pretty similar in size to current-generation consoles standing at a short 29cm tall. Unlike many of the little PC we see though, this one actually fits a real desktop i5-7400 CPU inside perfectly paired with a 3GB GTX 1060 which gives us excellent performance in games. Built in 802.11ac Wi-Fi provides a fast, stable connection while playing online games or streaming movies, the GR8 II also sports a handy Bluetooth v4.2 for connecting everything from smartphones to headsets – speaking of headsets, the shape and size of the GR8 II make it a pretty good headset holder too! On the back of the chassis, you’ll find 2x HDMI outputs making it ideal for a Virtual Reality setup, you can connect both your HTC Vive VR Headset and a TV for really good group gaming session in the lounge 🙂 It’s upgradable too, simple slide-off covers make for easy access to the M.2 SSD and additional 2.5” HDD/SSD storage slots for quick upgrades. Looking good with a clean matte black finish, the chiseled, sharply-angled side panels and plasma copper-coloured centre come together in an eye-catching way, even though it’s much smaller than most other gaming desktops the perfectly-framed ROG Eye on the side panel along with some sweet Aura effects across the front face make this mini Gaming PC stand out from the rest! UPDATE: Promotion extended, now 1st June 2017 to 31st July 2017. Asus ROG STRIX motherboards have killer looks and an all important feature which allows you to control a host of RGB devices from a single software package – we’ve done some special builds to demonstrate this and we know you’ll agree, when building a PC around Asus AURA RGB things really do look good! Getting your ROG bonus is pretty easy, once you’ve geared up with your killer new motherboard simply visit the ASUS Redemption Site to fill in your details on the form below. For system designers and builders there are literally thousands of component options to choose from, and within each component type there are masses of variants available for each with slightly tweaked voltage configurations, ascetic options and more. Luckily for everyone involved in this process the biggest players at the heart of the manufacturing side like Asus, ASrock and Gigabyte have excellent technicians that make lists available showing which parts they’ve certified for themselves. 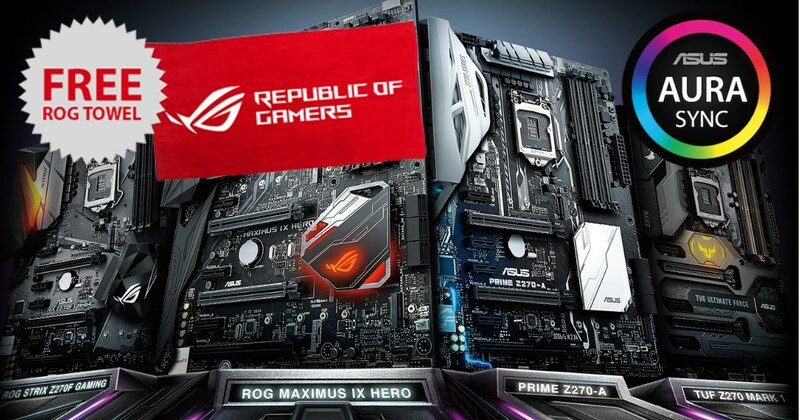 This certification sometimes carries on to the extreme level, when it does the item actually gets a special badge added to the specific hardware involved – items like these killer Asus Republic of Gamers RAM kits 🙂 These are certified versions of Team Group T-FORCE Dark memory with the classic Mayan style heatsink and have passed ROG stress tests thus becoming T-FORCE Dark ROG overclocking modules. Having these along with a ROG motherboard’s optimizing Ai overclock function (update that bios!) will enable you to automatically tune these kits to ROG limits. Further down the line there is yet another form of certification, this time as much from the players as it is the makers – like IEM (Intel Extreme Masters) which requires a system to meet certain specs in order to get the special badge. These usually have a set of guidelines that must be followed in order to be considered for certification, as you’d expect with the IEM ones these use specific gaming savvy intel CPU and Kingston RAM. Intel Extreme Masters is the longest running global pro gaming tour in the world. Started in 2006 by ESL, the competition features Counter-Strike: Global Offensive, StarCraft II and League of Legends tournaments across multiple continents with the next big CS:GO event scheduled for May 6th – 7th in Sydney, Australia. First it was a concept at Computex in June last year, now the gaming display of your dreams has come true. In case you haven’t heard, the new ROG Swift PG348Q is the new flagship gaming display. For those of you in search of the ultimate gaming display, you’d be hard-pressed to find one better. Before looking the specs, let’s not overlook the award-winning design with the Armor Titanium and Plasma Copper color scheme and ROG logo light projection. The gaming performance is equally matched with the aggressive design. PG348Q is exceptional in all the essential factors for what makes a great gaming display; a large display, high resolution, vibrant colors and color accuracy, high refresh rate, fast response time and exclusive gaming technologies (such as ASUS GamePlus & GameVisual, and NVIDIA G-SYNC). Besides all of these, you also get an ultra-wide curved screen which has you more immersed because it curves around you for a panoramic view. The ultra-wide 21:9 aspect ratio will make use of your peripheral vision while gaming as you will see more content horizontally which you normally won’t see, and every inch of your display will be utilized when watching a movie in 2.40:1 (the majority of existing movies are already available in 2.35:1 or greater). Having a 34-inch display so close to your face is simply massive, initially it would take a little time to get used to it if you’re upgrading from a smaller display. 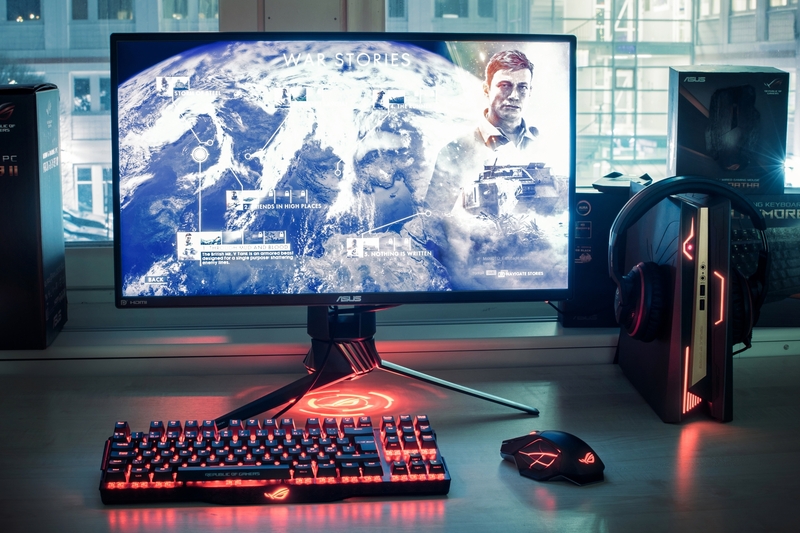 After spending some time with it – you simply can’t go back… This monitor is epic! UPDATE: There’s a massive range of Gaming Monitors available in NZ now, but this one’s still the best!